Meet a couple who stumbled onto a crafty new business, and find out how their work is international in scope. Handmade sculptures available at Steel Heart Ltd.
Inyone in search of original, custom steel and iron home and garden décor will find it at Steel Heart Ltd., 208 W. Front St., Harvard, in the historic Starline Building that houses artist galleries and studios. 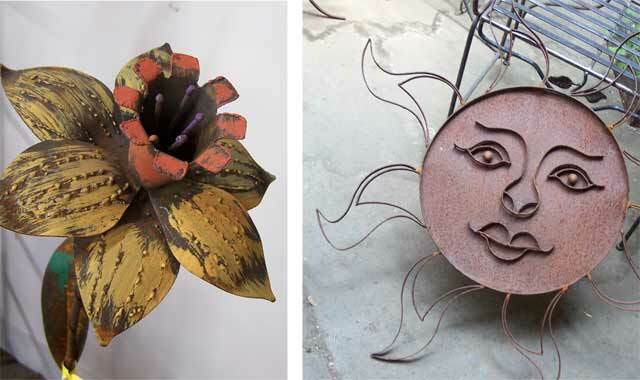 Owners Jacek and Gretchen Peczkowski have filled their large showroom and warehouse with original, handcrafted metal indoor and outdoor pieces: gazebos, trellises, obelisks, wind chimes, shepherd’s hooks, garden stakes, chandeliers, sculptures, wall hangings, armillary spheres, benches, chairs and more. The husband-and-wife team began the business in 1997, almost by chance. Jacek was a robotics technician working in the automotive industry, but he also enjoyed designing and creating furniture and decorative pieces for the couple’s home. It was after they put their house up for sale that the idea for Steel Heart formed. Jacek not only designed but also fabricated each piece by hand, first by himself, and as the business grew, with the help of local manufacturers. As the cost of local labor rose in post-NAFTA [North Atlantic Free Trade Agreement] years, it was no longer feasible to afford U.S. labor. When the pieces arrive at Steel Heart, they’re not finished. Jacek’s designs are all original. But if you happen to see a similar-looking item in a big-box store, chances are good that it’s a copy of something created by Steel Heart. Jacek’s distinctive work has even drawn the attention of an HGTV celebrity. The couple has two daughters. Kyra is a freshman at Wittenberg University in Ohio, and Ayla is a sophomore at Valparaiso University in Indiana. Both help out at the store, but each plans to pursue her own career. Jacek and Gretchen are in the process of renovating a farm that is more than 100 years old, so they can relocate the business there. Renovations include transforming the carriage house into office space, creating a showroom in the 1810 barn (which was part of the Underground Railroad and has a slave cellar, says Gretchen), and installing outdoor gardens to showcase their products in a natural setting. Jacek has already built a patio from stones originally used in China as washboards; he incorporated old millstones. A long, covered stone walkway leads to a larger covered pergola with an original granite table and chairs and custom fireplace. In another part of the generous yard, Jacek has created a circular walkway that winds through a stand of pine trees and a few other gardens, but he’s far from finished. The store also sells stone benches, urns, fountains, bubblers and figurines like gargoyles. Because of space limitations, there’s no way to display these in completed form. Jacek comes by his talents naturally. In his native homeland of Poland, his grandfather was a blacksmith, and his father was an avid gardener. The story of the couple’s meeting is as compelling as the evolution of the business. Steel Heart frequently expands its lines. And Jacek is always creating new designs. One new line, aptly called “New Line,” is made entirely from recycled materials, each piece individually cut, forged and welded. A big advantage of Steel Heart merchandise over mass manufactured items is its durability. Steel Heart has a delivery service, and will ship items to customers. “And we have one-of-a-kind pieces we can get for people,” says Gretchen. Gretchen believes her husband’s refugee background is a factor in their success. This entry was posted on Wednesday, June 27th, 2012 at 11:58 am	and is filed under Northwest Business Magazine. You can follow any responses to this entry through the RSS 2.0 feed. Both comments and pings are currently closed.